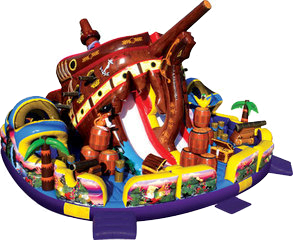 This Treasure Island Obstacle Course and Slide is one of the biggest pirate adventures you will expierence. It has 2 obstacles courses that kids compete to see who can slide down to victory. Real-life barrels, cannons, treasure chests, crawl throughs, tunnels and more. Recommend 3 kids at a time. Rental is for 4 hours and then $150 for every hour after.